Weimaraner: The Weimaraner Bible is everything you need to know about Weimaraners from Weimaraner Puppies, Weirmaraner Breeders, Weimaraner Rescue, bringing your Weimaranerhome, Weimaraner Dogs as Adults, Weirmaraner Health, Weirmaraner Temperament, Weirmaraner Training and all the proven insider tips you’ll need to succeed with this incredible breed! The Weimaraner is an amazingly rewarding breed and will surprise you with its intelligence- if you have the tips to understand its unique personality! Everything is covered from Weimaraner breed history, finding the best Weimaraner Breeders, Weimaraner Puppies and how to pick the best, Weimaraner Care, Weimaraner Health, Weimaraner Training, Weimaraner Adolescence, Weimaraner Adulthood, through to Weimaraner Old Age. The author covers details on Weimaraner Vaccinations, Weimaraner Price Ranges, Size, Lifespan, and much, much more. Another informative and entertaining title from dog expert Susanne Saben.Whether you are considering a Weimaraner for the first time, or a seasoned Weimaraner owner, the tricks and tips within this guide will prove invaluable. 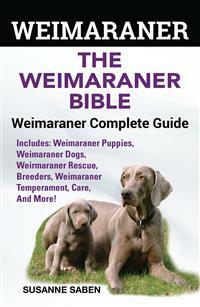 This book is the must-have guide for anybody passionate about the Weimaraner breed. The book is written in an easy to read and understandable style. In a straight forward, no-nonsense fashion, Susanne Saben covers all aspects of deciding on, adopting or buying a Weimaraner, Care, Health, Weimaraner Food, Weimaraner stages of life, travelling with your Weimaraner and having fun with your Weimaraner- throughout its life! Published by DYM Worldwide Publishers 2017. Disclaimer and Legal Notice. This product is not legal or medical advice and should not be interpreted in that manner. You need to do your own due diligence to determine if the content of this product is right for you. The author, publisher, distributors, and or/affiliates of this product are not liable for any damages or losses associated with the content in this product. While every attempt has been made to verify the information shared in this publication, neither the author, publisher, distributors, and/or affiliates assume any responsibility for errors, omissions, or contrary interpretation of the subject matter herein. Any perceived slights to any specific person(s) or organization(s) are purely unintentional. We have no control over the nature, content, and availability of the websites listed in this book. The inclusion of any website links does not necessarily imply a recommendation or endorse the views expressed within them. DYM Worldwide Publishers takes no responsibility for, and will not be liable for, the websites that are temporary or being removed from the Internet. The accuracy and completeness of the information provided herein and opinions stated herein are not guaranteed or warranted to produce any particular results, and the advice or strategies, contained herein may not be suitable for every individual. The author, publisher, distributors, and/or affiliates shall not be liable for any loss incurred as a consequence of the use and application, directly or indirectly of any information presented in this work. This publication is designed to provide information in regards to the subject matter covered. The information included in this book has been compiled to give an overview of the topics covered. The information contained in this book has been compiled to provide an overview of the subject. It is not intended as medical advice and should not be construed as such. For a firm diagnosis of any medical conditions you should consult a doctor or veterinarian (as related to animal health). The writer, publisher, distributors, and/or affiliates of this work are not responsible for any damages or negative consequences following any of the treatments or methods highlighted in this book. Website links are for informational purposes only and should not be seen as a personal endorsement; the same applies to any products or services mentioned in this work. The reader should also be aware that although the web links included were correct at the time of writing they may become out of date in the future. Any pricing or currency exchange rate information was accurate at the time of writing but may become out of date in the future. The Author, Publisher, distributors, and/or affiliates assume no responsibility for pricing and currency exchange rates mentioned within this work. Chapter 3 – Weimaraner Dog Types and Weimaraner Mix Dogs – The Long Haired Weimaraner and More! Does the Toy Weimaraner Exist? Weimaraner Space and Exercise Needs – Are They Easy to Keep? Weimaraner Temperament – Are They Family Dogs? Weimaraner Dogs and Other Pets – Do They Get Along? What Should You Know About Training a Weimaraner? Can You Handle a Weimaraner Dog? Chapter 5 – Weimaraner Puppies For Sale—Should You Buy a Weimaraner Puppy or Adopt from a Weimaraner Rescue? Weimaraner Puppies for Sale – Puppy or Adult Dog? Should You Buy a Puppy Weimaraner for Sale or Adopt from a Weimaraner Rescue? Chapter 7 – Weimaraner Breeders – How Do You Find a Responsible Breeder With a Healthy Weimaraner for Sale? What Supplies Does Your Weimaraner Puppy Need? What Nutrients Does Your Weimaraner Need? What is the Weimaraner’s Coat Like? Why Should You Consider Showing Your Weimaraner? Chapter 15 – Breeding Weimaraners – Is it Really the Best Choice for Your Dog? What Does it Take to Breed Dogs? This quality resource list will help you further maximize your experience with the Weimaraner breed. Enjoy! •	Blue Ridge Weimaranershttp://www.blueridgeweimaraners.com - USA Breeder, Based in Missouri, Family Business Great Story on Website. •	Drehbar Weimaranershttp://www.drehbarweims.com - USA Breeder, Based in Michigan, AKC and UKC Registered. •	Driftwood Weimaranershttp://driftwoodweimaraners.com USA Breeder, Based in North Carolina. Multiple Show Champions. •	HiBourne Weimaranershttp://www.hibourne.com - USA Breeder, Based in New York, Champion Versatile Weimaraners Since 1984. •	Indaba Weimaraners http://www.indabaweimaraners.com - USA Breeder, Based in Maine, Family Business for Over 50 years. •	Regen Weimaraners http://www.regen-weimaraners.com - USA Breeder, Based in Washington State, Multiple Top Champions in the Line. •	Schwartz Family Weimaranershttp://schwartzfamilyweimaraners.com - USA Breeder, Based in Pennsylvania, Puppy and Stud Service, Many Details on Website. •	Silverpoint Weimaranershttp://www.silverpointweimaraners.com - USA Breeder, Based in Kansas, Many Champions in the Line. •	Silversmith Farmhttp://www.silversmithfarm.com - USA Breeder, Based in South Carolina, Many Champions in the Line. •	Vega Weimaraners http://www.vegaweim.com - USA Breeder, Based in Florida, Member of ASPB. •	Willow Ridge Weimaraners http://www.willowridgeweimaraners.com - USA Breeder, Based in Kentucky, Many Positive Testimonials on Site. •	Wire Grass Weimaraners http://www.wiregrassweimaranerstoo.com - USA Breeder, Florida Based. •	Bartland Weimaranershttp://www.bartlandweimaraners.com - Canada Breeder, based in British Columbia, Over 20 Years Experience, Multiple Champions in Line. •	Minstergate Weimaranershttp://www.minstergate-weimaraners.org.uk - UK Breeders, Based in York, Over 25 Years of Experience. •	Kalimor Weimaranershttp://kalimorweimaraners.co.uk - UK Breeders, Hertfordshire, Kennel Club Assured Breeder. “Chewy.com” – http://www.chewy.com USA Site, Great selection of extremely tough chew toys, search “Kong” brand for your Weimaraner on the site. “JeffersPet.com” – http://www.jefferspet.com Extensive Tough Toys and other Supplies, look for Kong brand. “Most Popular Dog Breeds in America & Weimaraner Breed Standards” - http://www.akc.org/ American Kennel Club. “Westpawdesign.com” – http://www.westpaw.com - Check out the extremely tough “Tux” toys for your Weimaraner. W hen you see a Weimaraner dog there is no way to confuse it for another breed. Sometimes nicknamed “the Gray Ghost,” these dogs have an unmistakable silver-gray coat that sometimes exhibits a bluish sheen. In addition to their coat color, Weimaraners are also easy to identify by their long legs, lithe bodies, and large floppy ears. From the very first time you see a Weimaraner, this is not a breed you will soon forget! I distinctly remember the first time I saw a Weimaraner. I was hiking through the woods at a park near my house, enjoying the cool weather as summer transitioned into fall. I was coming around a bend in the trail when I saw a mystical grey creature come bursting through the brush, running right toward me. I stopped in my tracks, mesmerized by the beauty of the thing and was still in a bit of shock when the creature came right up to me and I realized that I was being greeted by one of the most beautiful dogs I had ever seen. As the dog nuzzled my hands and sniffed me over, his owner came around the bend, apologizing for his dog being so forward. I dismissed the apology and immediately began peppering him with questions about his beautiful dog. What breed was he? Where did he come from? How could I find one for myself! The Weimaraner is a skilled hunting dog with versatile applications for pointing, tracking, and more.